If any of you know my ten-year old son, Spenser, then you know he is capable of something like this. Earlier this week, he asked me to sign a document. When I asked him what I was signing, he said it was a contract. 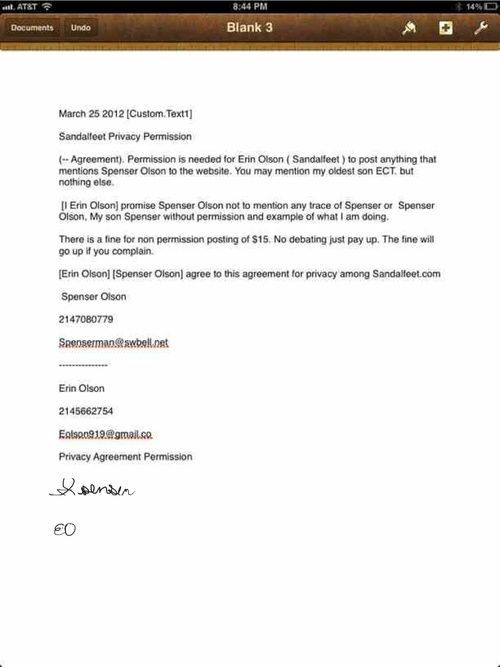 The contract is an agreement between he and I that I am not allowed to use his name or speak about him in my blogs without his authorization. If I violate the contract, I am subject to penalties. Man, what is he going to be like when he is 15? So yes, I did ask his permission before I wrote this blog! 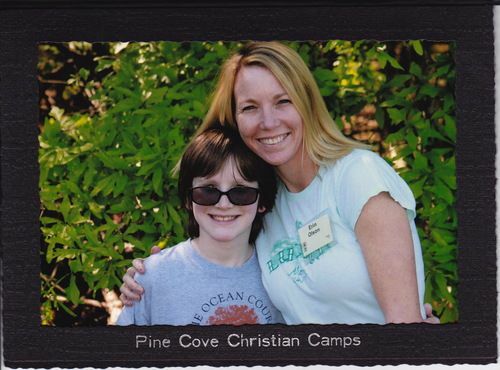 This past weekend, Spenser and I had the privilege to attend a Mother/Son weekend retreat at Pinecove Christian Camp. Now, we are not big campers (and I actually think I am a little more adaptable to camping than Spenser), but we weren’t roughing it by any means. We had a comfortable bunkroom that we shared with 3 other moms and boys and an adjoining bathroom area that we shared with 4 other moms and boys. We had running water, plumbing and hot showers. We didn’t have to plan one meal the entire retreat. We literally just showed up when the chow bell rang. It was awesome! What I enjoyed most about the retreat was seeing these boys that ranged in age from kindergartners through sixth graders so eager to spend time with their moms. Sure, they were excited to play with the other boys that were there, but they wanted to include their moms too. I had never played gaga ball before, but let me tell you, it was so much fun. And I loved it when one of the moms was the winner! These little boys and young men were holding their moms’ hands, holding the doors open for them, serving them food and saying, “yes, mam.” It was a mother’s dream. If I could bottle the aches I am feeling this week I would because the aches are so full of memories. We were blessed to have a wonderful speaker. Carrie Langemeier is the wife of the Pinecove Director and a mother to five beautiful children (three boys and two girls). She was an honest and humble speaker. She embodied the kind of humility that comes only through someone with a relationship with Christ. She was not just standing up there feeding us information on how to raise our boys, she was baring her soul, including all of her mistakes, stumbles, do-overs and successes. She also shared the stage with someone. That someone was Carrie’s 19-year-old son, Austin. Austin arrived on Saturday to speak alongside her. As her oldest child, he was a recipient of some of her motherly missteps, but most of all, he received her love. The two of them can laugh about it now, but I can relate to some of the heated and tense moments they had together. As Carrie grew in wisdom over the last few years, she became more aware of her mistakes and her personal baggage. She would often share these mistakes with her son – she was real with him – so he could see that “momma makes mistakes too.” Out of this realness, here was this 6’4” young man of 19 who hugged his mother with love - real love. He wasn’t ashamed to hug his mother in front of a hundred boys, their moms and camp counselors. It was so encouraging. Mothers and sons have a strange bond. Mothers grow these boys in their womb and nurture them just like our daughters (if you have them), but something happens sometimes. The world today is a “boys will be boys” mentality. I often disagree with this. I think it is okay for boys to be hugged, snuggled and kissed and I also think it is okay for boys to cry and share their emotions. The boys who pull away are sometimes the ones who need it the most. It seems like around the age of 5 or 6, we stop hugging our boys as much. As toddlers, we are always carrying them or tucking them in, but as they become more independent, it becomes easier not to do this. I started thinking about this the last few days. If we (moms and dads) aren’t hugging them, where are they getting physical contact? Probably nowhere. No wonder boys become grabby and aggressive. They just want to touch something or someone. I have a husband who hugs me everyday, often times multiple times throughout the day. With two other (younger) children in my home, there is not a day that goes by that I am not in physical contact with someone. I couldn’t imagine being a boy who no longer receives hugs every day from the age of 5 to 16 or 18 (or when they get their first girlfriend). Could you imagine going ten years without physical contact? Mothers and sons often bang heads. Mothers are growing these little boys to become young men who are going to go on to lead their families, businesses, sports teams, churches, etc. They begin to assert their independence at quite a young age – even if we don’t recognize it. Think about it, the youngest king in the Bible, Josiah, was only 8 years old when he was appointed king and he reigned for 31 years (2 Kings 22:1). I can’t imagine my son at 10 being responsible for a whole kingdom, but yet, I know that through God, anything is possible. Our boys will grow up and go on to live their lives. We need to love them now and not push them away. As they grow and marry, they will be responsible for taking care of their wife and any children they may have. But boys, who are grown to respect their mothers and receive unconditional love from their mothers, will always make sure their mothers are taken care of. How do I know this? Are you growing a relationship with your son(s) that is this intimate? I am not just writing this blog for others, but I am also writing it to and for myself. I need this word as much as anyone. Mothers, admit that you are not perfect, admit that you will make mistakes, admit your mistakes in front of your son(s), laugh together, cry together, but most of all, love each other. Jesus gave us the best example of a man, who once was a boy, who loved his mother even at the end. Erin, thank you so much for sharing this with me! It encouraged me so much today! And I really needed it. I am humbled by your kind words. But even more humbled that our gracious God chooses to use me. I am grateful that the weekend was a blessing to you and to your son! I hope that you are able to come back and play gaga ball with us again! !